We were up early, to get to Mae Haad pier as soon as possible. Trying to check out, the staff didn’t have the key to the safe, so couldn’t get my passport out. Eventually the key was found and we were trying to escape Koh Tao for a second day. The pier was pretty quiet when we got there, so we were right at the front to get our tickets re-confirmed. One way or another we would be leaving today! In the queue we saw the Basingstoke trio again, and also got chatting to a Melbourne couple who seemed pretty chilled out. It’s a shame that we don’t plan to as far as Melbourne. They made it sound like our sort of place. Nic and I took some travel sickness tablets and by some amazing fluke we survived the whole return trip without revisiting our breakfast. The journey was loads better, but there was still a load of sick bags being passed around. The pier rumour may have been correct, as we ended up docked in a fishing village, where waiting TV crews were interviewing people as the loaded off the boat. There was a free coach into Chumporn Town, so we got that. We found Fame Guesthouse near the Railway Station, and paid £1.50 each for a basic room with no fan and shared bathroom. It was fine by us, and the perfect place to recover from the island. Fame have a decent restaurant downstairs which serves good cheap food, and even makes their own fresh bread every day. We went to the Tourism Authority of Thailand office to find out about trains south. Bad news. No trains yet, but there should be one to Hat Yai in the next couple of days. The Thai Met Office have advised against all non-essential travel to islands in the east or west and also advised caution in Southern Thailand. I am getting worried about missing our flight from Singapore to Bali on April 11th. Bali could be our only chance of getting on the beach. Although not here by choice, Chumporn actually seems quite interesting. We ate some good street food at the night market, and the whole place is not really geared towards tourists. Often people pass straight through here on the way to the islands, but I will be happy to explore around here for a couple of days until the trains are running again. 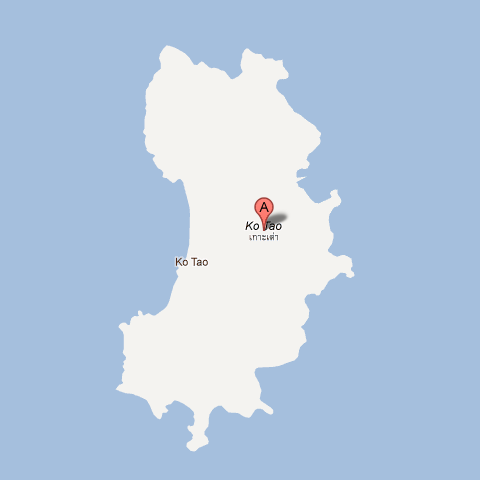 This island is so small that it doesn’t even have roads on google maps. At the moment there are no roads anyway, just a series of rivers. It’s still raining and nobody knows how long it will last. We also heard that Burma has had an earthquake. Not sure how bad it is yet. When we finally get off this island we are heading straight for the mainland and staying there. None of us wants to spend any more time on an island. I am suitably freaked out. Spending time stranded on an island wouldn’t be the worst thing in the world, but I’m out of books. There is a secondhand bookstore here, but they want £6 for a pirate photocopy of a real book. We are going to a bar tonight to watch a pirate screening of Napoleon Dynamite. Should lighten the mood a bit. BBC News and google haven’t really got any info about this situation, so we are relying on information from locals and other travellers. This gives the Chinese whispers effect, where it can be hard to determine the real facts. So it seems we are stranded here for the time being. Luckily we found somewhere cheap to stay whilst we wait out this storm. We have a couple of weeks until we fly out of Singapore, so hopefully we can get out by then. The thought of getting on another boat is turning my stomach. At the moment I’m happy to just sit tight and wait. We had no electricity all day, as the generators were being switched off to conserve fuel. The water was also switched off to avoid contamination from the floods. Most of the shops were closed, except a small swedish shop, which was selling snacks by candlelight. The flood water had now spread from the main road, and there was now 8-10 inches flowing down our road. We had to walk barefoot, to stop our flip-flops being washed away. We could see that Porto Bello was one of the few restaurants with lights on, so we would be eating there again. Pete went out to take some photos and stopped by Porto Bello to ask about the floods. He said that this weather is worse than they had in the monsoon, and the worse summer rain for over 9 years. People expect things to start back up in two or three days, but I’m sure they are just making that up. There doesn’t seem to be any real forecast about this. A local phrase we hear a lot here is, “tomorrow is better….. maybe,” which I suppose is optimistic. We don’t know if the Japanese Tsunami has played a part in this crazy weather. Some people are convinced it did. It’s strange to be stranded in something like this. It’s normally the sort of thing that you see on the news. Local houses are being washed away. We overheard a local talking about a rock that smashed through his house. He was asleep and luckily got out before his house collapsed. He did have a black eye. We moved our backpacks into the wardrobe as we noticed a damp patch appearing on the ceiling. We later booked an extra two nights, as we can’t really go anywhere. The weather is about 25°C so at least it isn’t cold. We decided to have a look at the famous sights of Bangkok today, so we booked our transport to Koh Tao, left our baggage at the tour office, and then set out for the day. We started at the National Gallery and Museum, which were free today due to a public holiday. Then we made our way to the famous Emerald Buddha. We arrived to total chaos so decided to skip this one and go to see Wat Pho instead. It was a good call, as Wat Pho has a massive gold reclining Buddha and large grounds to walk around. There were big stone guardians at the gates. Frank and Chick left early to return to Khao San Road, but Nic and I decided to head for Wat Arun. We walked via a street market, monument bridge, and a lovely waterside path before snaking through back streets to reach the temple. The temple looked really different and was covered in tiny ceramic tiles. By the time we got there, we didn’t even have time to go in, so we flagged down a Tuk-Tuk to take us back to Khao San Road. It only cost a pound, which was a bargain, as it took ages to get back. After eating, we headed for the tour office at about 6:30pm, but didn’t get on a bus until almost 9pm. On the plus side, I got chatting to an Indonesian guy Boris, who was travelling to Koh Tao to work. He gave me his copy of the guide-book, which we hadn’t been able to get anywhere else. Our drive to the national park took about an hour (In the car above). 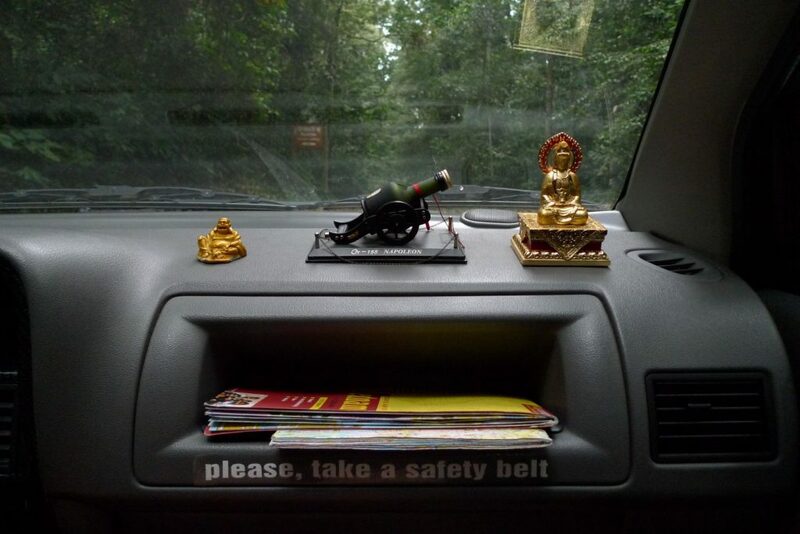 It cost about a pound to get in to the park, which included a guide for the primate and elephant conservation areas. Elephants and primates were rescued and returned to nature wherever possible. We were driven to cave where ancient human remains had been found. We got to just go in and explore. There were hardly any other tourists in the whole park. We had lunch at the top of the park and then went for an unguided walk through the forest. The start of the walk was on a concrete pathway, but it soon gave way to dirt tracks. Along the route we saw a big old tree, some scenic views and another cave. Palace Cave.Luckily I had my head torch so we were able to go into the cave and have a look round. We were only a few hundred yards in when I couldn’t even see my own hand in front of my face. Frank went off a little further into the cave, with only a tiny LED light, which stopped working halfway. This cave seemed to be sucking the light from our torches so we made a speedy exit. If we hadn’t left Hanoi, then I would have much positive to say about Vietnam, but Ninh Binh has shown me a different side. Maybe Hanoi is just another big busy city. Maybe we were silly and unlucky. We definitely didn’t have a great time there and can’t wait to get back to happy, easy Thailand. I can’t wait for another happy Sawasdee from a smiling Thai. Tomorrow we will hire some bikes or mopeds to have a look round Tam Coc. I am thinking of trying a geared bike, as I’ve always wanted to learn to ride. The main problem is navigating the busy 1A road to get fuel before we leave. That will be fun. We had a free bread and jam breakfast whilst our Hotel owner booked us a taxi to the Railway Station. We packed our bags and then forced our way through the busy daytime streets to the main road. We found two waiting taxis, but only one had a driver so we chose that one. We are smart travellers. We loaded our backpacks into the boot and all got in. The driver ignored us and left the ignition off. We showed him a picture of a train on he map, but he wouldn’t get going. For fear of him driving off with our stuff, we opened the boot and unloaded our stuff while Frank went round the corner to get the Hotel owner. The driver and Hotelier shouted at each other for a few minutes. Then we got the thumbs up. This time, he started the car and we were off. It was only a short ride and cost about a quid. At the railway station, we couldn’t help think that the title on the ticket desk was a bit misleading. She didn’t seem to want to sell us tickets. We eventually coaxed the tickets out of her, but had a few hours to kill before the train to Ninh Binh was due. We wanted to lock our backpacks in the lockers, but were told by the attendant that we couldn’t use the lockers. We would have to leave our bags with her behind a desk. We didn’t like the sound of that, so took all our stuff back out to the busy street. We needed to find somewhere to chill out and waste some time. In this part of town this proved easier said than done. The pavements were again full of motorbikes so we ended up walking along busy roads until we reached a small park and lake. Actually more of a muddy puddle. We sat in the windy park for a while, and then took shelter in a small restaurant. It was a locals only place, but we managed to order some food and drinks. The drinks were fine but the food was awful. The driest piece of chicken I had ever seen, on a bed of raw vegetables. Lovely. We hadn’t quite wasted enough time yet, and as we wandered around, thought we had hit the jackpot when we saw a KFC! We went in, but it was closed. At lunchtime! Madness. We ended up at another bad restaurant where Nic had some food which was almost as bad as mine. The train was on time and busy. Some people had so much luggage that they must have been moving house. They had bags, boxes, TVs, books, lampshades and anything you could imagine. We arrived at the tiny Ninh Binh station which had no maps or guides at all. We didn’t have a clue how to find our Hotel. Frank asked in a guesthouse next to the station, and the woman was kind enough to give us a photocopied hand-drawn map of the area. She even marked off our hotel for us. It was a few minutes walk through town and we could see instantly that this was a much more relaxed place. Apart from the massive main road, the other roads were actually quite safe to walk down, without fear of being run over. On the way we had children coming up to us and saying hello and old people smiling as we walked past. Much nicer place. The Ngoc Anh Hotel was exactly where our map said it would be. It was tidy and quite new. The rooms were pretty new and had decent bathrooms. The staff here were really helpful and were happy to arrange trips too. We booked a trip for tomorrow. We get our own driver in a 4×4 to take us round the nearby national park. It cost $40 USD but between the four of us that’s pretty good going.